"I say the singularity of this coincidence absolutely stupefied me for a time. This is the usual effect of such coincidences. The mind struggles to establish a connection—a sequence of causes and effect—and, being unable to do so, suffers a species of temporary paralysis. But, when I recovered from this stupor, there dawned upon me gradually a conviction which startled me even far more than the coincidence." 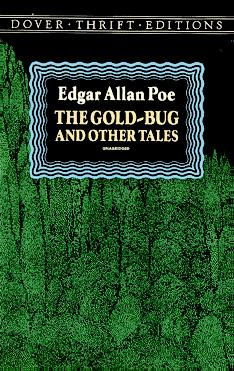 About the story: The Gold Bug is a short story written by Edgar Allan Poe and is the first story in his Tales of Mystery and Imagination collection (which I am currently reading.) Poe is supposed to have submitted this story to a writing contest and won a prize of a hundred dollars, making it one of his most widely read and appreciated stories, during his lifetime. My Thoughts: The story is very unique and lovely, and the atmosphere, quintessentially Poe; eerie and dark. I loved that though the story is a treasure-hunt, it doesn't focus on what treasure they found and what they did with it, but the element of mystery and the "drum-roll" or suspense that is built up on the way. I loved the eccentric characters and the narration. What I really appreciated, was that the narration is very precise. You find out close to nothing about the narrator, making it easy, even, to relate to the story; I could easily put myself in the narrator's shoes. Also, the narrator sticks to the one story and skillfully avoids writing anything irrelevant to this plot; in fact, even the names of characters other than the ones critical to the plot aren't mentioned. Poe was known to have an intense interest in cryptography; and I could see that from the story. The detailed descriptions of the code-breaking and puzzle-solving were very intriguing and entertaining. The descriptions are vivid and there is a tinge of humour to the writing, though the language does take some getting used to. The story also had " 53(85;8*+6*3 "
This is definitely one of my favourite short stories by Poe and certainly a must read! Great site to read some good stories.